File policies are a great tool for finding threats to your information protection policies. For instance, create file policies that find places where users stored sensitive information, credit card numbers, and third-party ICAP files in your cloud. This tutorial helps you use Microsoft Cloud App Security to detect unwanted files stored in your cloud that leave you vulnerable, and take immediate action to stop them in their tracks and lock down the files that pose a threat by using Admin quarantine to protect your files in the cloud, remediate problems, and prevent future leaks from occurring. For a list of apps that support admin quarantine, see the the list of governance actions. 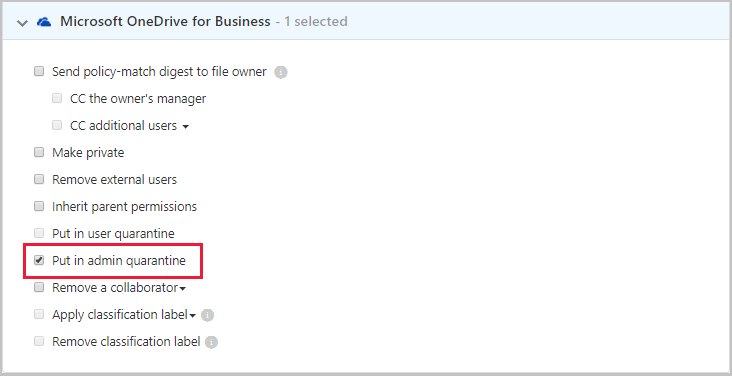 When a file matches a policy, the Admin quarantine option will be available for the file. The original file is moved to the admin quarantine folder you set. A tombstone file is uploaded to the original file location. The user can only access the tombstone file. In the file, they can read the custom guidelines provided by IT and the correlation ID to give IT to release the file. 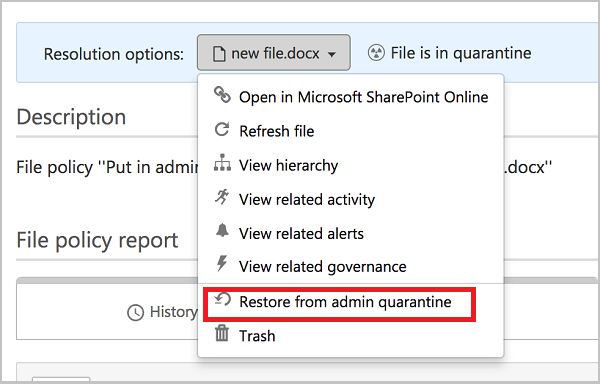 Inspect the file in the quarantined folder on SharePoint online. You can also look at the audit logs to deep dive into the file properties. If you find the file is against corporate policy, run the organization’s Incident Response (IR) process. If you find that the file is harmless, you can restore the file from quarantine. At that point the original file is released, meaning it's copied back to the original location, the tombstone is deleted, and the user can access the file. Validate that the policy runs smoothly. Then, you can use the automatic governance actions in the policy to prevent further leaks and automatically apply an Admin quarantine when the policy is matched. Original shares are not restored, default folder inheritance applied. The restored file contains only the most recent version. The quarantine folder site access management is the customer’s responsibility. An ICAP third-party policy such as a policy that looks for Vontu. To set admin quarantine settings, under the settings cog, go to Settings. Provide a location for the quarantined files and a user notification that your user will receive when their file is quarantined. For Box, the quarantine folder location and user message can't be customized. The folder location is the drive of the admin who connected Box to Cloud App Security and the user message is: This file was quarantined to your administrator's drive because it might violate your company's security and compliance policies. Contact your IT administrator for help.